Stale Gum: My take on the 2011 Topps design. 1) No Moose-Knuckle. 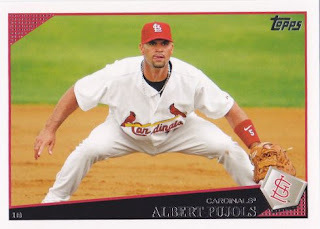 If I see another card of Albert Pujols' moose-knuckle, I swear, I'm going to off myself. 2) Going back to team logos after a year of wordmarks. Wordmarks are like Topps 206, something to be used once-per-decade, at most. 3) No unnecessary "boxes" or "dots." 1) Unnecessary repetition of team name. We get it. 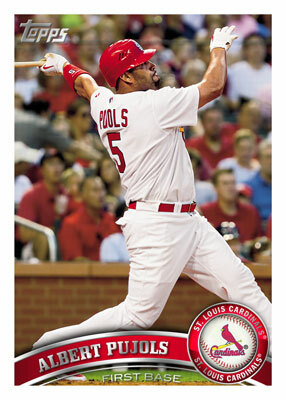 Albert Pujols plays for the Cardinals. Do you have to state it TWICE AROUND THE TEAM LOGO? Isn't that a little too redundant? 3) Where's that way-cool 60th Anniversary logo you showed us at The National? 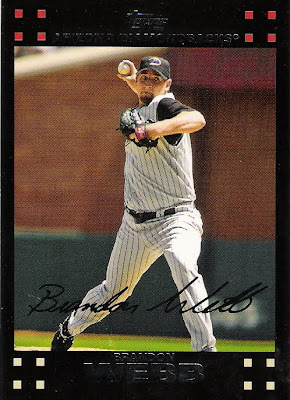 4) If you were a novice baseball fan and had no idea what position Albert Pujols plays, would you be able to find it on this card? yea, i was looking forward to a foil logo like on the 2001 cards (50th anny). I like the design. The repetitive team name I could do without. To solve the long name issue you can just put those players on a horizontal card. It gives them almost two times as much space to use. When the heck did this get released? I need to be more mindful of Facebook and Twitter and all that newfangled crapola. I like it. Looks classy. Slightly worried about the front text legibility with all that foil everywhere. If the numbers on the back remain readable to old men with horrific eyesight I shall approve of this design. At my job you would lose two days for thinking. Let's see if Topps figures out the long name issue as you suggest. Like the cards, agree with the redundant names, redundant names. Cards made especially for Jimmie 2 Times. The white borders allow for black cards #/60, can't wait. Answer to Minus #4: Ummm yeah, it says "First Base" right below the name.